Like a fool, many years ago I donated a perfectly fine vacuum tube tester that had been given to me by an über-engineer/ham I worked with during the time (nearly 30 years ago) I was restoring my first vintage tube radio. Bad move. 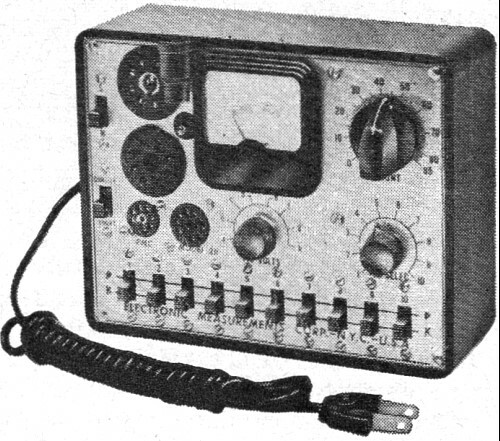 It was a really nice tester: a B&K Model 650 Dyna-Quik Dynamic Mutual Conductance Tube & Transistor Tester. It was sold shortly after I had also given away as a wedding gift the Crosley floor console radio that I restored. Another bad move. Now, many moons later, I am working to restore yet another Crosley tube radio and I sure wish I had held on to it. Similar tube testers are routinely selling on eBay for $100-$200. At some point I'll buy another tube tester, maybe even another B&K Model 650 just for nostalgia's sake. The vacuum tube - delicate heart of most electronic equipment - is understandably subject to many ills. Its elements can become shorted together, disconnected from their pins, or loose on their mountings. Its filament or heater can burn out, just like a light bulb. Its cathode, intended to supply a steady stream of electrons to be shaped and molded by the tube's other elements, can partially "dry up" and refuse to part with enough electrons. Or its grid or some other element can begin acting like a cathode and start spurting out an electron stream of its own. Then, too, the tube itself can become gassy or noisy. Or it can just get "tired out" - no specific trouble may show up, but the tube simply doesn't have the "oomph" to do its job properly any longer. Fig. 1. 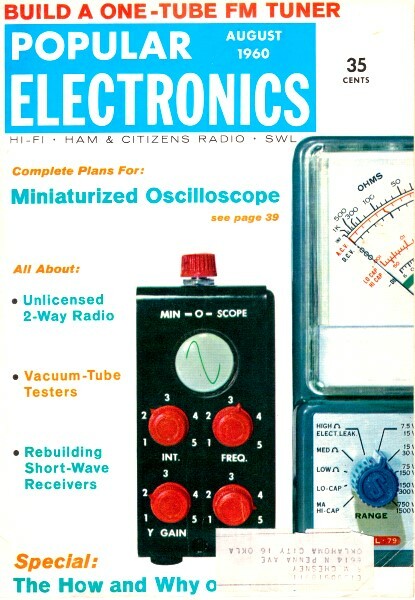 A continuity checker, such as the EICO Model 612, is among the simplest types of tube testers. Helpful in tracking down tube troubles, it has a pilot lamp which will light if tube filaments or heaters are okay. Some of these troubles can be tracked down without a tube tester. A simple filament continuity tester, such as the EICO Model 612 shown in Fig. 1, will quickly reveal open filaments. Alternatively, an open filament or inter-element short circuit can be located with an ohmmeter. Tubes suspected of other troubles can be yanked out and replaced with new ones to see if this makes any difference - if, that is, you happen to have a spare of the right type on hand or don't mind buying one. But these methods have their shortcomings. A continuity tester or ohmmeter provides only the crudest type of test. And the replacement method is subject to error because other circuit elements, in addition to a defective tube, might be faulty. Thus, plugging in a new tube in such cases might make no difference, and the troubleshooter might conclude that the original tube was okay. For these reasons, service technicians and electronic experimenters look to their tube testers for quick, accurate information about the condition of- the tubes they use. 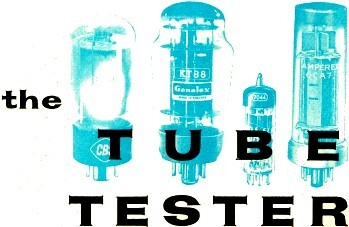 Tube testers are equipped to probe every aspect of a tube's "state of health." Most testers, in addition to giving some general indication of tube quality, also check for shorts, loose elements, and other possible sources of trouble. Types of Testers. Tube testers are divided into two general types, depending on the method used to test overall quality. Some, called emission testers, have the plate and all grids tied together. A positive voltage is applied to the plate and grids, and the current in the cathode circuit is measured. In other words, such testers show just how many electrons the cathode is capable of emitting under given conditions of plate voltage. But since the primary purpose of a tube is to amplify (except for diodes and other special-purpose tubes which are always given simple emission tests), the most accurate and revealing test is to see how efficiently a tube operates as an amplifier. This is called mutual-conductance testing. Mutual conductance is simply a measure of the effect small variations in grid voltage have on plate current. To put it another way, mutual-conductance testers measure how well amplifier tubes work under actual operating conditions. Since they are more complex than emission testers, they naturally cost more. Let's run through the normal tube-testing procedure to see what you should and should not do when using a tube tester. 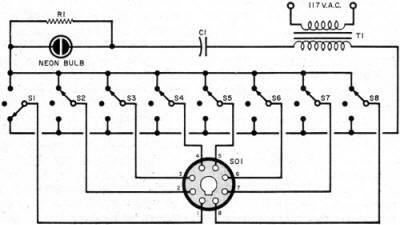 We'll digress from time to time in order to examine some tube-tester circuitry in detail. Testing for Shorts. First, turn on the instrument and adjust the line-voltage calibration control. Most testers provide this adjustment-it simply insures consistent in­dications by cancelling out normal line-volt­age variations. 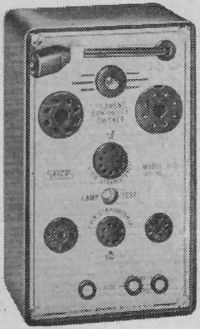 Next, locate the tube type to be checked on the tester's tube chart, and set all of the dials and levers as speci­fied for that particular tube. Make sure that they are all accurately set, and that you haven't confused two . 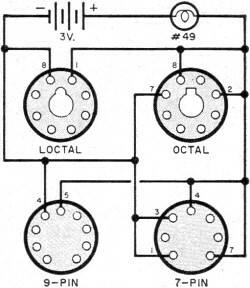 tubes on the chart with similar designations-a 6J5 for a 6J6, for instance. Now plug in the tube. Wait about 30 seconds for the tube to warm up, then test for shorts according to direc­tions in the tester's instruction manual. 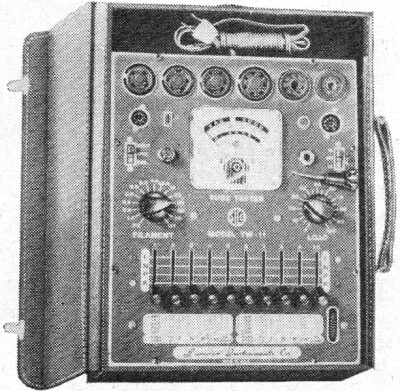 Figure 2 shows how the EMC Model 211 tube-tester checks for shorts. Each element in the tube under test is connected to the center arm of a s.p.d.t. switch as shown in this simplified diagram. Next, each switch is thrown to the test position, one at a time, then returned to "normal." When one switch is in the test position and the others "normal," all elements except the one being tested are hooked to one side of a circuit containing a power source and a neon bulb. 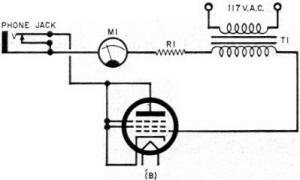 The isolated element is hooked to the other side of the same circuit. If a short exists between the isolated element and any other tube element, the circuit is completed and the bulb flashes on. Fig. 2. Inter-element shorts can be quickly and easily located with tube testers such as the EMC Model 211. For simplicity, this diagram of a portion of the 211 's circuitry shows only one of the unit's tube sockets. In testing for shorts with the EMC 211, as with most other testers, disregard momentary flashes of the neon bulb when you throw one of the switches. These flashes are caused by the discharge of inter-electrode and stray circuit capacitances. It's also a good idea to tap the tube under test gently with your finger throughout the test; this will reveal any loose elements which might short out under vibration. While testing for shorts, make sure that the indicator bulb does not glow even faintly, except for flashes when you throw the switches. A very weak glow, if .continuous, can indicate a high-resistance leakage path, even though no direct short exists. Most tube testers are not equipped to make sensitive leakage tests - such tests were not usually necessary until FM and TV came along. Some AM radios and amplifiers operate unimpaired with a leaky tube, but sensitive FM and TV circuits generally react adversely to even the slightest leakage. For this reason, many manufacturers are now turning out highly sensitive leakage testers, both as separate units and as part of regular testers. More about this next month. Incidentally, "shorts" will show up across the filament or heater terminals, and in cases where single elements are connected internally to more than one pin. A "short" indication here, of course, is perfectly normal, and the tube-tester chart will indicate where these normal "shorts" should appear. If shorts other than normal ones show up during testing, the tube should be discarded. A shorted tube can, under certain conditions, damage a tube tester if the tube is tested for emission or mutual conductance. For this reason, tubes should always be tested for shorts first, and thrown out immediately if shorted. Testing for Noise. Many testers provide a circuit for testing noisy or potentially noisy tubes, and this is a logical test to make next. Loose tube elements frequently cause noise. These elements tend to vibrate, changing inter-electrode spacing and hence capacitance and other circuit constants. 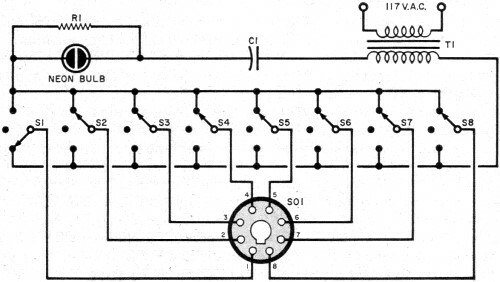 Figure 3(A) shows a simplified diagram of the noise-testing circuit of the Superior Model TW-11 tube tester. Using a switching circuit similar to that used for short testing, one element at a time is hooked through a pair of magnetic headphones (crystal phones won't do here) to one side of a transformer. The other tube elements - all shorted together - are hooked to the other side. Figure 3 (B) shows a still further simplified diagram with the grid under test, and the switching circuits eliminated for clarity. Tap the tube lightly with your finger during the test; if there are any loose elements, they will vibrate and cause a ringing or "pinging" in the headphones. Fig. 3. Simplified schematic (A) of noise-testing circuit in Superior Model TW-11 tube tester (see photo to the left). Further simplification of this circuit (B) shows the tube under test for grid noise; the remaining elements are connected in parallel. At this point, we are ready to test emission or mutual conductance - depending on your tester- and run checks for open elements and gas. Next month, we'll examine these functions in detail, and look over the field of "quick" testers, cathode-ray testers, transistor testers, and other special-purpose instruments.